"Wherever there is Ganesh, there is Success and Prosperity" and "Wherever there is Success and Prosperity there is Ganesh"
According to one tradition, Ganesha was a brahmacārin, that is, unmarried. This pattern is primarily popular in southern India . This tradition was linked to Hindu concepts of the relationship between celibacy and the development of spiritual power. In the north of India , on the other hand, Ganesha is often portrayed as married to the two daughters of Brahma: Buddhi ((also called Riddhi) intellect) and Siddhi (spiritual power). As a child Lord Ganesh was once playing with a cat. He pulled its tail and rolled it on the ground. Later, tired of this game, He decided to spend time with His mother, Parvati. He found her covered in dirt and with bruises. “Remember the cat you were playing with… that was me. I am the Divine power that is exists in all beings.” Lord Ganesh realised that all women are extensions of His mother and decided never to marry. Another interpretation is that His devotion towards His mother is the reason why He is considered as a celibate bachelor. To Him, she was the most beautiful and a perfect woman. 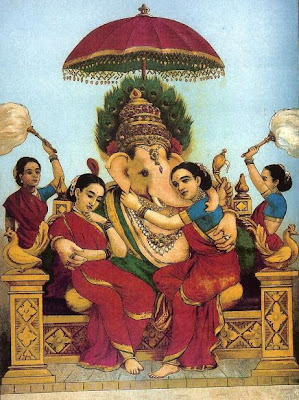 He vowed that He could marry the girl who would match up to His mother’s beauty and divine qualities.It is said that Lord Ganesh was unable to find a suitable mate because of His unique appearance. This bothered Him and He summoned the rats to burrow deep holes in the path of any God who were on their way to get married. The potholes made the journey of the grooms and their marriage processions extremely difficult. Frustrated, they went to Lord Brahma to complain. Lord Brahma created two beautiful girls Riddhi (Abundance. Opulence, Wealth) and Siddhi / Buddhi (Intellectual and Spiritual Prowess) and they were married to Him. With His two consorts, He had sons Shubha (Auspiciousness) and Labha (Profit) and a daughter named Santoshi (Goddess of Satisfaction / Contentment).The Shiva Purana states that King Prajapati had two daughters - Riddhi and Siddhi. He approached Shiva and Parvati for the marriage of his girls to Lord Ganesh and Lord Kartikeyan / Karthikeyan (Lord Ganesh’s younger brother). But both these girls wished that Lord Ganesh should be their husband and so they were married. It is said that if one has Riddhi but doesn’t have Siddhi / Buddhi then it is worthless. Possessing only Siddhi without Riddhi is also futile. Lord Ganesh bestows both these blessings to His ardent devotees. If we delve into ourselves we will realize that we are all Ganapatis (Gana is our body made of the Pancha-Mahabhuta (Five elements), Pati stands for master or owner). Thus He shows us the way to achieve both intellect and wealth to enjoy a rewarding life. There is another mythology, especially in Bengal , which goes in that Ganesha is married to the Kalabou. The Kalabou is nothing but a banana tree draped in traditional white with a Bengali saree with a red border. The story goes that, when Ganesha was supposed to marry, one day when he came home, he saw his mother Durga eating with all her ten hands. Shocked, he asked why is she doing it. Durga replied that if, after Ganesha marries, his wife would not give Durga any food, so Durga is eating to her heart's content with all ten hands. Feeling very sad, Ganesha decided that he would marry a banana tree or Kalabou so that her mother never has any worries about food, as a banana tree cannot stop her from eating. 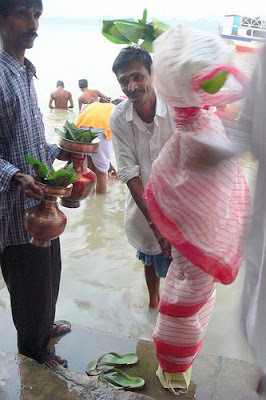 In the early hours of Saptami, the kalabou is taken for a bath to the Holy Ganges. Water from the Ganges accompanied with Dhak and Kanshi finishes the bathing ceremony. After the bathing ceremony she is adorned in a red-bordered white sari and vermilion is smeared on its leaves. She is then placed on a decorated pedestal and worshipped with flowers, sandalwood paste, and incense sticks. Later she is placed on the right side of Lord Ganesh. This is the reason she is popularly known as Ganesh's wife.